characteristics are a compliment to their devoted and loving personalities. choice for companions and family members. Although quiet in nature they create strong bonds with their human families. You will enjoy their sweet and playful nature during the day and their snuggling while relaxing in the evening. Luxurious and sweet, the white Persian cat is truly in a class of its own! 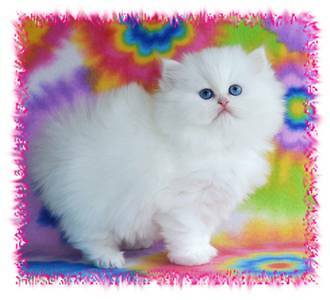 Each of our Persian Kittens for sale has a dedicated page. Visit our Birth Announcement page to see more kittens for sale!